Salad bars are my lunch choice when eating out these days. I’ve written about three near Millennium Park in Chicago, not far from my office. 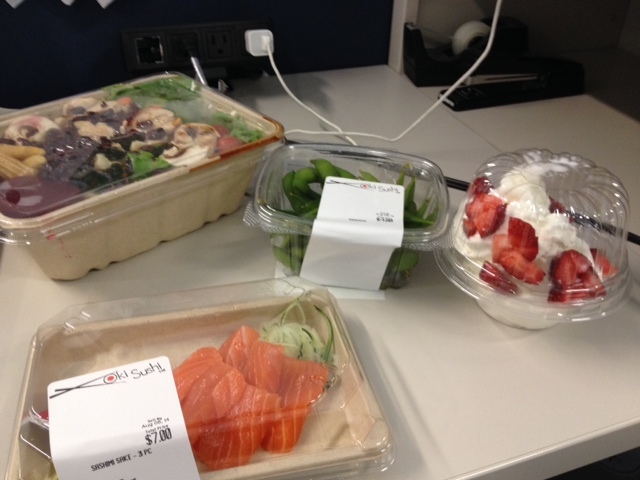 My very expensive attempt to fill up at lunch — salad, salmon, edamame and frozen yogurt. I’ve alluded in several posts here to the turkey meatloaf which has become a staple of my low-fat, low-salt diet these days. I find it simple to make and tasty too. Plus, if you make a big one, you can have it ready for additional meals when you need something that is quick to make for dinner during the week. 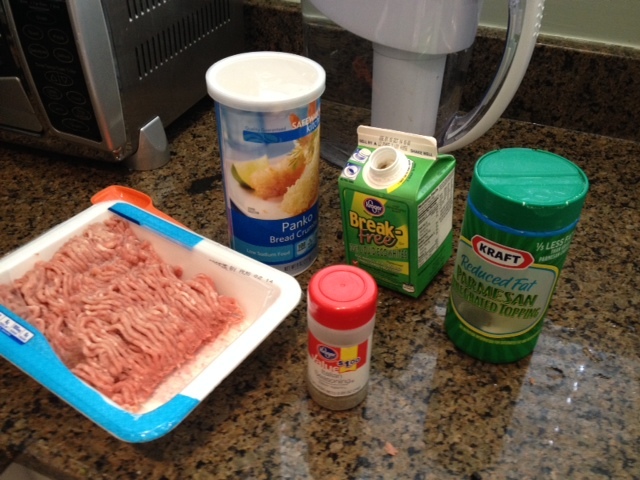 All the ingredients you’ll need for your turkey meatloaf. Grilled peppers and stuffed peppers are among my favorite foods, harkening back to my Italian roots and such familiar Italian-American favorites as grilled peppers and onions. If you enjoy North African spices, this could be the dish for you. 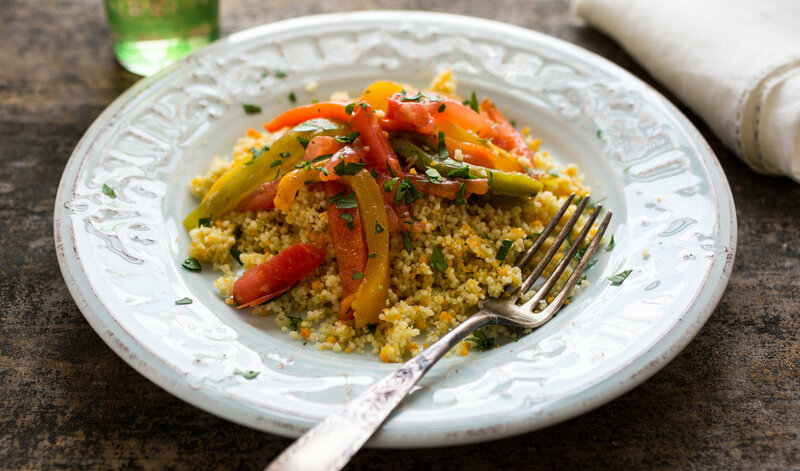 So I’m intrigued about trying a recipe I saw in the New York Times for Tunisian grilled peppers and couscous. I’d leave out the salt, of course, and am not sure how I’d react to all the other spices included here, but I’m open to trying it sometime. This recipe comes from the Times Recipes for Health section, which sometimes has recipes I want to try immediately but other times still has too much salt in recipes for my taste. If you try these peppers before me, let me know how it is. 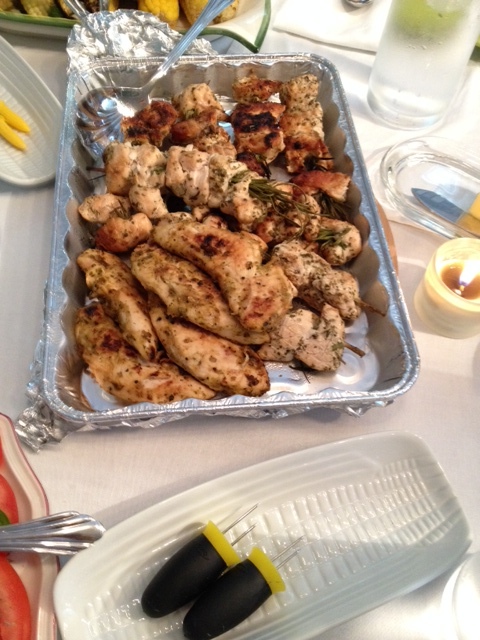 I wrote recently about a Sunday dinner I created using chicken skewered on rosemary sprigs as a main dish. To accompany that and a salmon I made for the same meal, I went with simple side dishes that included grilled zucchini, tomato slices with basil and olive oil, and green beans freshly picked from my garden and cooked in olive oil and spices. 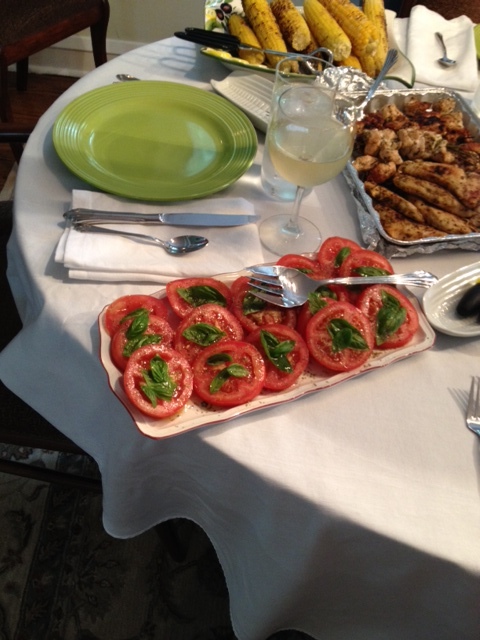 A simple approach, fresh tomatoes, fresh basil and wonderful olive oil. Eating chicken breast can get boring fast given that white meat, while the lowest-fat part of the chicken, also is the driest. I tend to cook it covered with tomato sauce or some other ingredient to add some flavor to it. Chicken rosemary skewers are wonderfully flavorful and easy to make. Finding salt-free bread pre-made is so difficult, I may give this a try, substituting whole wheat flour. For weeks I had been trawling the internet for recipes with low or no salt/sugar bread recipes that produces lovely light fluffy bread. I happened across a very simple recipe after looking at a baby lead weaning forum. We have a bread machine (bought for £5 off eBay!) that really simplifies the bread making process even more. It’s a Panasonic, after doing some research these were recommended but I think they all seem fairly similar. For this recipe I used white flour, I’m going to make a brown this week so will report back if any changes are needed. Set on a basic (3 hour) bake with a modicum sized loaf and whichever crust setting you desire. 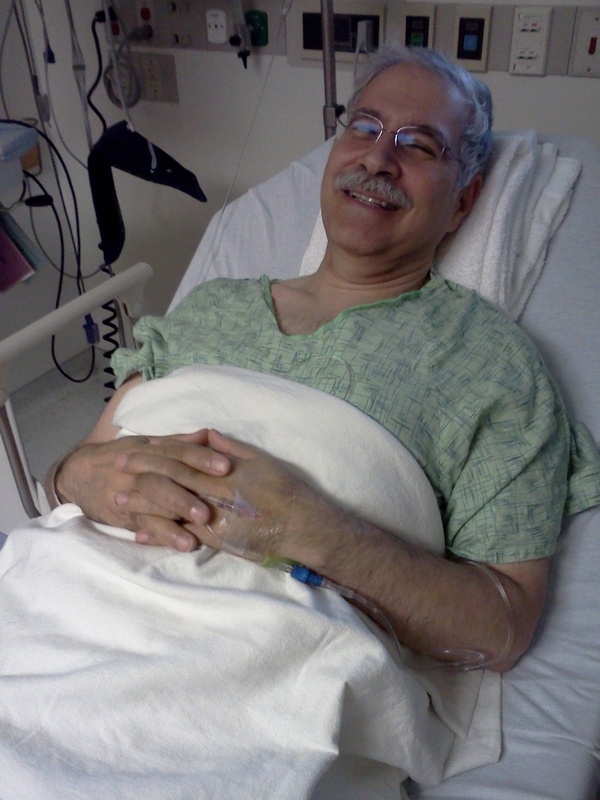 One of the three nutritionists I saw after my angioplasty in 2012 recommended I eat only egg whites rather than whole eggs to avoid cholesterol in eggs. Other nutritionists disagree about this. Indeed, eggs seem to be making a comeback and I’m sure the Egg Board, which promotes their consumption, is happy that it’s PR work over the years is bearing fruit. But I prefer to avoid eggs these days and stick to egg whites only. I’ve been buying whatever brand of packaged egg whites is on sale. 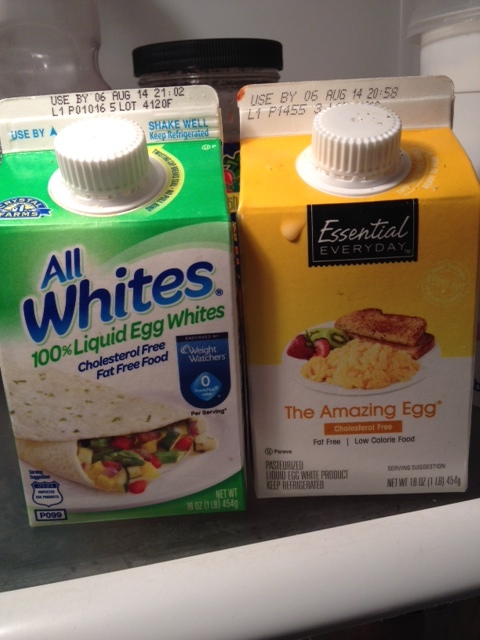 But then I realized that all egg white are not the same. 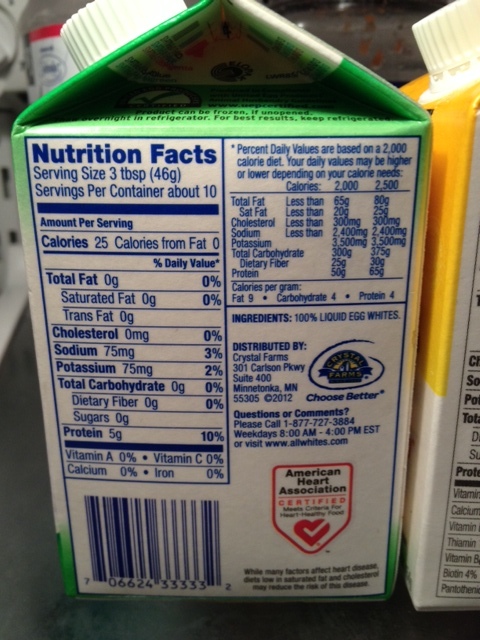 A store brand I bought, shown here, has lots of additional ingredients, as you can see on my photos here. 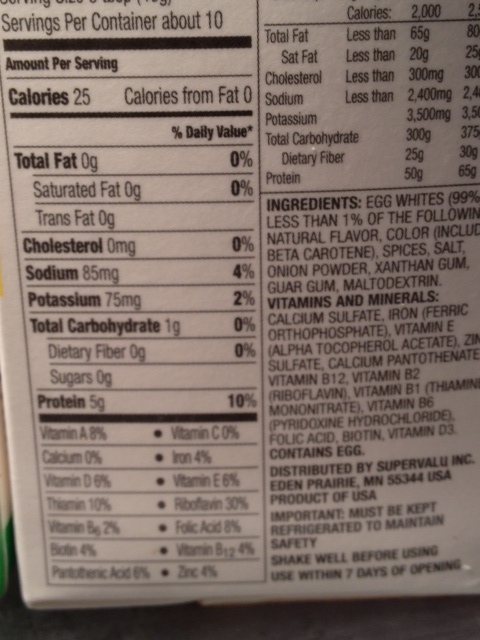 Another brand I found lists only egg whites as the ingredient in the carton. So that’s the one I’m sticking with these days.It doesn’t scramble yellow like the other does, but now I know that comes from added coloring which I’d rather not have. Check the ingredients before buying packaged egg whites. All brands are not the same. Egg whites are its only ingredient. 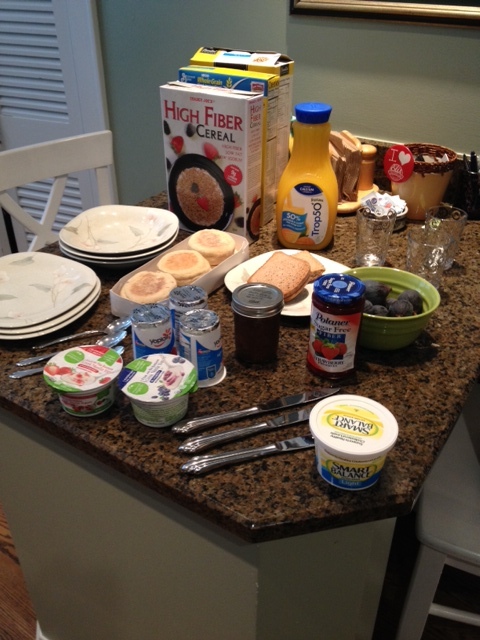 This store brand has a lot in it besides egg whites.